The client is a 50-year-old company that has evolved into a bona fide “brand performance agency”, offering an insights-driven suite of services designed to maximize a brand’s potential in the marketplace. The client adds expertise and value at every conceivable stage of a brand performance process; from research and planning to product development, and from sourcing and fulfilment to global distribution. 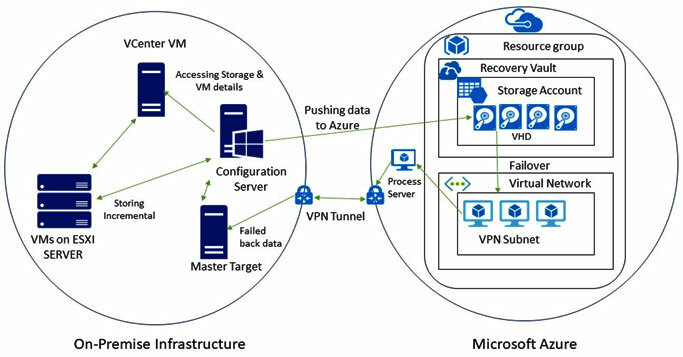 By adopting Azure Site Recovery solution, the client can recover quickly from disasters like Power failure, natural calamity, short circuit, hardware failure etc., with minimal downtime and monetary loss as possible; owing to the cost-effectiveness, ease of use, and support for an extensive list of workloads provided by Azure. Need a reliable and automated disaster recovery solution? Small and Medium Enterprises understand the importance of a disaster recovery site to ensure business continuity and to keep their business running. However, a traditional DR site involves the establishment of a secondary data centre at an additional cost which most SMEs cannot afford. The secondary data centre runs in parallel to the primary data centre, thus an Enterprise needs to manage two data centres at all times; this imposes an additional cost burden to the company. Thus, the client wanted a reliable yet cost-effective solution for creating a Disaster recovery site. This would help them in keeping their data safe, and apps/workloads running, when planned & unplanned outages occur. Saviant's Azure consultants studied the complete on-premise IT Infrastructure of the client and created a DR Site in Azure Cloud using the Azure Site Recovery Service. The solution pushes the complete on-premise data by 'Delta Encoding' technique to orchestrate the on-premise IT Infrastructure in Azure Virtual Network. In the case of any Disaster scenario in the on-premise IT Infrastructure, all the applications can easily & seamlessly 'FAILOVER' and start working from the Azure environment with minimum data loss. Once the on-premise IT Infrastructure is back to normal, Azure Site Recovery service enables easy and seamless 'FAILBACK' to the original on-premise infrastructure. Azure Site Recovery is the most cost-effective way for Enterprises to adopt Disaster Recovery processes; as they can leverage this on a very small scale and gradually increase as and when required. Also, the cost involved is only for replicating & storing and no fees are required during the ongoing protection. Also, when setting up the DR site, an Enterprise need not buy any additional hardware or software - as Azure provides all the necessary set-up. Even after the DR site is completely functional, only upon any disaster event does the one on Azure runs. However, an Enterprise can completely overlook the cost and hassles involved in maintaining two parallel data centres. Need to ensure faster disaster recovery for your applications?